LUMPENPROLETARIAT—Dr. Kevin Fox Gotham (Tulane University, School of Liberal Arts, Dept. of Sociology) has written a must-read book for all Americans, Race, Real Estate, and Uneven Development: The Kansas City Experience, 1900-2000 (2002: State University of New York Press). Many people often think of neighborhoods, which are populated mainly by a certain ethnicity (or ‘race‘), as being the result of personal choice or preference. Historically, ethnic residential enclaves have been transitional, as various ethnicities have been absorbed into the larger population over time. We can talk about places like your nearest Chinatown. But such neighborhoods are mainly business districts, not residential districts. Here, we’re talking about ghettos, residential districts. The only ethnicity (beyond indigenous Native Americans), which has been systematically segregated and prevented from integrating into the USA’s post-WWII suburbanisation, are blacks, Americans of African descent. Before the 1940s, industrial cities in the USA had dominant industries centrally located with the working classes clustered in the urban core, near their places of work, largely due to the limitations of transportation. After the 1940s, we see a historical trend of industrial dispersal of industries out of central cities. Firms and corporations, mired in class conflict and bent on union avoidance, began to forgo the benefits of economies of agglomeration and began fleeing to rural areas in search of cheaper and non-organised wage labour to exploit. As this occurred, many blacks who had been gaining employment in the peripheral industries of the urban core, servicing the primary industries, were left behind trapped by the structural unemployment of the deindustrialisation of the urban core. Racial/racist residential restrictive covenants and Jim Crow segregation laws had laid the institutional framework for society’s racist violations of the human rights of blacks. When the state had to admit the unconstitutionality of government segregation laws and racially restrictive covenants, the private sector took the reins. Redlining and the denial to blacks of credit and banking services helped operationalise twentieth century segregation, helping create USA’s ghettos. Blacks were, basically, denied loans and services their white counterparts depended upon. As working class whites moved on out to the suburbs, as the urban core was abandoned by firms and corporations, working class blacks were institutionally and legally segregated and prevented from moving into the suburbs, which the real estate industry was propagandising as white neighborhoods for profit. This white flight and manipulation of housing markets trapped most blacks without adequate jobs in concentrated pockets of poverty. For the first time in U.S. history, we saw geographic concentration of poverty, as a result of institutionalised racial/racist segregation. Before then, poverty had been quite evenly dispersed. So, USA’s ghettos are a twentieth century phenomena created by our business and government elites, who decided to confine black people to poverty for profit. Gotham’s book, Race, Real Estate, and Uneven Development: The Kansas City Experience, 1900-2000, is based on the work of Massey and Denton (1993) , who drew attention to the “missing link” to explaining persistent, multi-generational poverty—segregation. This is important history, which needs to be taught in schools, community colleges, and universities. Most of us have tragically misunderstood the true nature of capitalist elites’ role in the creation of the USA’s ghettos. This history must be discussed in popular discourse in our nation, if we are to have a clear understanding of the nature and origin of urban poverty, so as to inform effective decision-making with regard to our social responses to urban poverty. Gotham’s book proves what many of us have long suspected about ghettos. They have been institutionally created, and not only through the violence of segregation laws, Jim Crow laws, and the lynchings of the 1910s and 1920s. Segregation laws were ruled unconstitutional by 1916. Racially restrictive covenants were also ruled unconstitutional by 1947. Yet, most of the Great Migration of blacks from the south to the north, occurred during the second wave, known as the Second Great Migration, when the industrial city started to become the corporate city after the 1940s. When the state was unable to keep all of its racist laws on the books, as blacks migrated north, the private sector, led by the real estate industry, was able to continue the project of segregating U.S. cities for profit. Gotham lays out, with rigorous evidence, how ghettos were created through the profit motive of the real estate industry, which exploited and exacerbated existing racism and prejudices among whites to use blockbusting, and the use of agent provacateurs to induce panic sales of properties, and other unscrupulous means to destabilise housing markets. The more people buy and sell houses, the more money, the real estate industry makes. So, the real estate industry actually fomented fear of blacks moving into, or near, white neighborhoods to induce white flight, so as to increase their own profits. Traditional explanations of metropolitan development and urban racial segregation have emphasized the role of consumer demand and market dynamics. 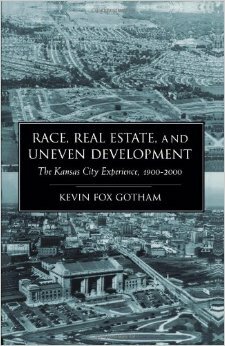 In Race, Real Estate, and Uneven Development: The Kansas City Experience, 1900-2000, Kevin Fox Gotham reexamines the assumptions behind these explanations and offers a provocative new thesis. Using the Kansas City metropolitan area as a case study, Gotham provides both quantitative and qualitative documentation of the role of the real estate industry and the Federal Housing Administration, demonstrating how these institutions have promulgated racial residential segregation and uneven development. Gotham challenges contemporary explanations while providing fresh insights into the racialization of metropolitan space, the interlocking dimensions of class and race in metropolitan development, and the importance of analyzing housing as a system of social stratification. Read more at SUNY Press, including table of contents for Race, Real Estate and Uneven Development. We should note, however, that it was not only blacks who suffered under racially restrictive covenants, racial residential segregation, redlining, and so forth. Mexicans, Hispanics, Jews, and other groups, along a hierarchical ethnic pecking order were also discriminated against and faced barriers to integrating into the broader society. Your author’s Hispanic political science professor, years ago, at San Joaquin Delta College in Stockton, California described how he and his spouse were denied the option freely given to whites to buy a house west of Interstate 5, which divided Stockton up until the 1970s. Blacks were not allowed west of Interstate 5, unless it was to perform domestic work. Not only blacks, but other non-whites faced racial residential segregation. Massey, Douglas S. and Nancy A. Denton. 1993. American Apartheid. Cambridge, MA and London: Harvard University Press. Davis, Otto A. and Andrew B. Whinston. 1961. “The Economics of Urban Renewal” Law and Contemporary Problems, 26 (1) 105-117. Blacks are largely held at bay to the east of Troost Avenue, with a band of predominantly white neighborhoods living adjacent to Troost, west of the parallel north-south Holmes Road and Rockhill Road. Just a mile or two further west is the Kansas state line, which really gets white and wealthy. As your author writes this, with rear balcony facing Troost Avenue, a helicopter, or as Ice Cube calls it, ghetto bird, approaches and begins to hover around. The helicopter appeared shortly after gunshots were fired. Your author still hasn’t quite acclimated to the sound of gunshots. The first shot sounded pretty close, and it startled your author. We return to our in-breath and out-breath, calm ourselves, and take the first steps to continue living. But life along, and east of, Troost Avenue in Kansas City is harsh and, often, tragic. Urban blight, dilapidated housing, and abandoned properties dominate the landscape. Amazingly, if you just walk a block or two to the west of Troost, it’s like a different world entirely. The legacy of segregation continues. It seems interesting, considering Kansas City, Missouri is home to the historic neighborhood of Westport, famed for its historic Battle of Westport. The Civil War and the Battle of Westport were watershed episodes of history, leaving clear lines of demarcation where opposing forces met. It seems a sort of stand-off continues in Kansas City, as expressed by the fierce segregation represented to this day by the Troost Wall. Thank you for your kind words. And thank you for reading Lumpenproletariat.